So you've got your new blog up and running, everything is great, until you open a post to view it and see your content is cut off. If you encounter this problem check the settings outlined below to fix the issue, if these don't do it, contact our support team for more help! First we want to look at the post content canvas itself on the single post page in Showit. Click the canvas itself, not an element on the canvas, and make sure under the canvas tab in the right sidebar the canvas type is set to "grow with content." 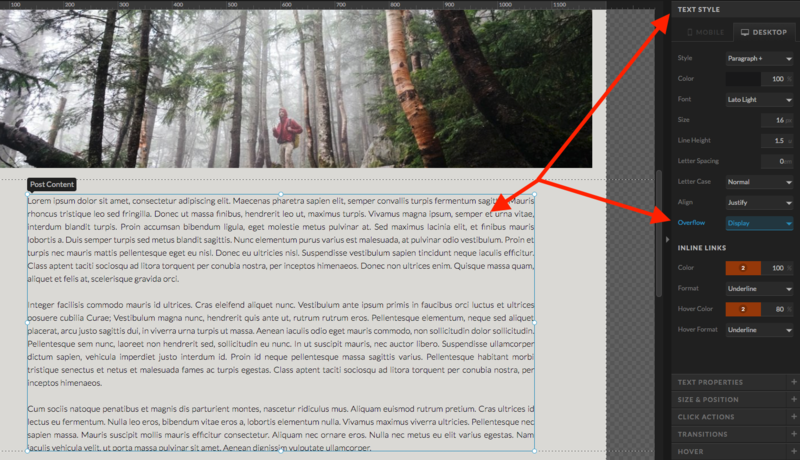 Any canvas that contains post content in the blog pages should be set to this type. The next area to troubleshoot would be the post content text box itself. Click the post content text box to select it. Then under the Text Style tab in the right sidebar look for the "overflow" setting about halfway down. This should be set to "display" but sometimes is gets set to "crop" instead which would cut off your content. Ensure it is set to display as shown below.